Cruising at 75 MPH for a road trip I got 40+ mpg. Around town I have got around 30 in mildly spirited driving. The car is extremely solid. The doors "thunk" like you would not expect from a small car. I got red leather seats, and it is actually pretty nice leather. For an $18000 car, I feel like I got a steal. 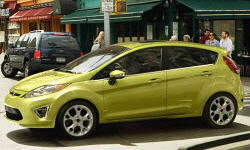 For as well as it handles, I would expect the Fiesta to have a stiffer/rougher ride. But it has an excellent ride. Basically, it is a two seater. Car seats and small children will fit ok in the back. Essentially it is a great commuter car. I wish the rear seats folded flat to make the hatch a little bigger. They fold, but not that well. More like an afterthought.